Atrial fibrillation, which is also known as arrhythmia,refers to having a quivering or irregular heartbeat. It occurs when erratic or extra electrical signals impact on the heart's natural pacemaker, causing the heart to quiver or beat faster. Having an irregular heartbeat can lead to a stroke or heart failure. Just as Apple did with the US rollout of its ECG app, it's also bringing the irregular heart rate rhythm notifications for Watch Series 1 or later Apple Watches. Harnessing the optical heart rate sensor, the feature will occasionally check heart rhythms and send a notification if it detects an irregular heart rhythm that would suggest atrial fibrillation. However, it will only do this if an irregular rhythm is detected on five checks over a minimum of 65 minutes. 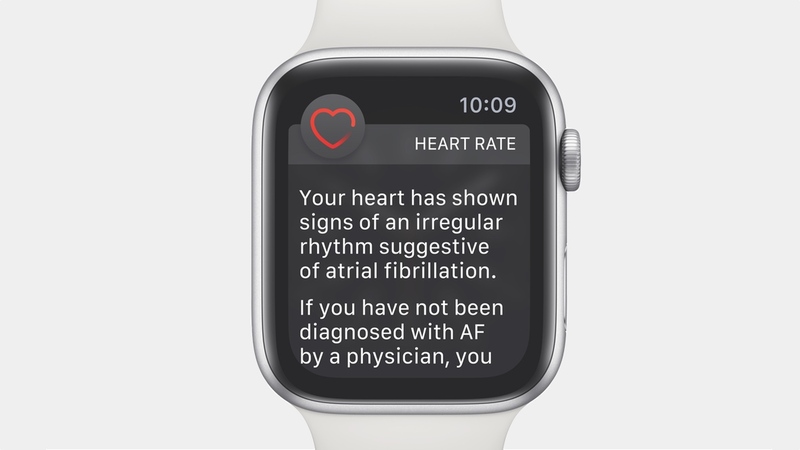 The feature was part of Apple's recent Heart Study, which included over 400,000 participants to explore whether Apple's tech could be deemed suitable to detect atrial fibrillation. As mentioned you'll need to download the watchOS 5.1.2 update to your Series 4 to unlock the ECG support. The same needs to be done to use the irregular rhythm notification feature if you're rocking an older Apple Watch. You'll also need to make sure your iPhone is running on the iOS version 12.2 to make sure everything is in working order.